Cosmonauts land on the planet Venus. However, they find themselves in danger from the voracious monsters they find on it. A rocket from a distant planet approaching Earth must land on Mars due to a technical defect, thus the inhabitants of the Earth rush to their help. Do You Dare Take the Trip Into the 25th Century? The story was changed substantially, the ship's flight direction reversed (making it an alien ship traveling to Earth), and the Statue of Liberty pasted into the final shot. The cast and staff's names in the credits were altered significantly to look like English. from "King David" aka "Le Roi David"
This is an intriguing Czech science fiction film from the early 60's. 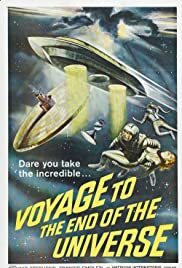 It's pretty much unknown in the U.S (American - International Pictures dubbed it into English and released it as "Voyage to the End of the Universe" in 1964; it's been seen here only rarely since then). The movie depicts a group of space travelers on a seemingly endless journey to a new planet. They encounter many traps and dangers along the way (including a derelict spacecraft and a mysterious nebula) but the greatest conflict seems to be psychological: namely, the titanic ambition of a 15-year, trans-galactic voyage pitted against the fragility of the human mind and the relative insignificance of human lives. The interior sets are lavish -- certainly on a par with "Forbidden Planet" and perhaps even "2001". The level of detail in the spaceship interiors is admirable, and the same can be said for the smartly designed spacesuits. "Ikarie XB 1" stumbles badly, though, when it comes to the exterior effects work. The spacecraft models are too small to provide much detail, and seem to be propelled through space by dark-colored string. As a result the transitions between interior and exterior shots are somewhat jarring. All the same, this movie is a very interesting example of mid-century science fiction. It deserves a much wider audience, and it is to be hoped that a restored, subtitled print will one day make the rounds in American art houses. Cross your fingers.